If manganese is present in the water, you may see black or brown staining on your fixtures. You may even notice a blackish-brown string or yarn type substance in the toilet tanks. The acceptable level for manganese is less than 0.05 mg/L. 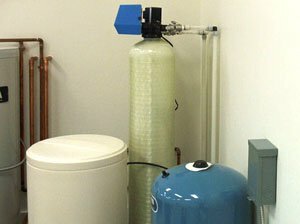 Typically, a Softener or Greensand Filter will remove this issue, however, often times, manganese and iron will appear together in well water, so it is best to have an onsite evaluation so the appropriate system is installed. The hardness of water basically depends on the amount of dissolved calcium and magnesium present in the water. These minerals to create scales in cold water piping and heated water can cause a build up in water heaters, boilers, and other appliances leading to a boost in heating bills by as much as 20%. Unsightly film or scum in the tub and other fixtures may build up and may require more soap to be used for cleaning. It can build up on skin and hair and can cause dry skin, brittle hair, skin irritation and clogged pores. You may notice graying of whites or loss of brightness in colored laundry; hardness can cut back the life cycle of clothing by 35%. In addition, the calcium and magnesium will be absorbed by foods cooked in hard water and foods are more likely to shrink and become tough. The level of hardness in water is usually expressed as grains per gallon (gpg) or milligrams per liter (mg/l). The levels are noted under the page Drinking Water. If you have manganese or hard water, a Softener may be needed. Often times, manganese and iron will appear together in well water, so it is best to have an evaluation so the appropriate system is installed. 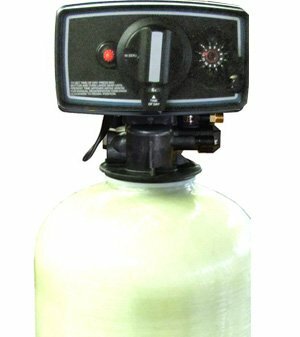 A Softener system consists of a mineral tank containing resin, a brine tank containing salt, and a control head. A Softener works through a chemical process called ion exchange. The hardness (or manganese, etc.) attaches to the ions and are removed from your water. Eventually the resin becomes saturated and needs to be regenerated (or backwashed). 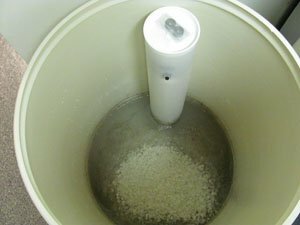 The control head on the Softener is set to automatically backwash the filter every few days to clean out the resin inside the tank. The level of hardness (or other items found in your water) and daily usage of water will determine how often the system should regenerate or clean itself. The resin will last for several years without needing to be replaced, but the brine tank must be filled with salt on a regular basis. Typically, one bag per month is needed and several bags may be added to last you for several months (for example, you may add 4 bags of salt every 4 months). 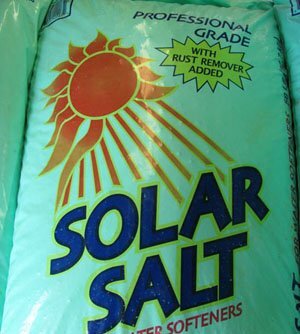 We recommend using the blue bags of softening salt; 40lb. bags can be purchased at most hardware or home supply stores or 50lb. bags may be purchased at the office. There are special circumstances that require different types of Softeners, so you may require an Anion Blend Softener or a Tannins Softener. Even though the basics are the same, if you have questions about these types of Softeners, please contact us directly.